Our outside permit stickers are durable, weatherproof and UV fade resistant. 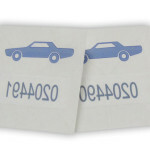 They are the perfect parking permit for keeping track of each vehicle owner. 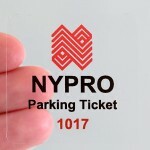 Custom parking stickers can adhere to either the inside or outside of window glass & windshields depending on how you want to use them. 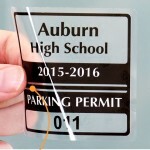 Static cling vehicle stickers are useful for controlling parking lots, pick-up and drop-off areas in schools, apartments and parking areas. Add bar codes for gated communities that need to scan for automatic gate access. 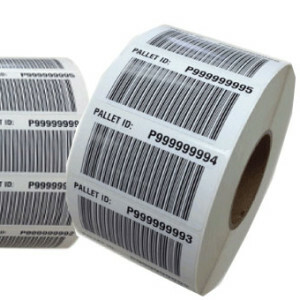 We offer a wide range of consecutive numbering configurations with bar codes. 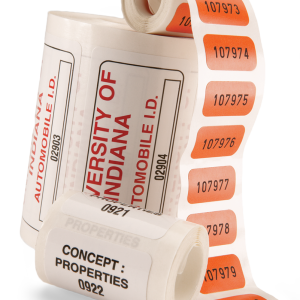 Your can order your labels with specialty coatings, perforations on individual labels and with perforations. Let us know your requirements and we will provide you with exactly what you need. Consecutive numbers and bar coding for inventory of assets. The perfect way to track inventory and identify assets for your accounting. Materials range from low-cost paper to vinyls and polyesters with a top coat laminate that resists abrasions, weather, and solvents. Blue Line Labels delivers your order accurately and on time. Our 20 years of art, design and print experience will assure you of an excellent quality product and a professional cost effective relationship. We can help from concept to completion or anywhere in between. Call us to discuss your consecutive numbering label needs at 1-800-609-7079. Or simply fill out the on-line quote. We can visit your location or stop by our label and packaging showroom when your in the Pompano, Fort Lauderdale, Coral Springs and Margate area. Enter The Result Of: 7+6=?